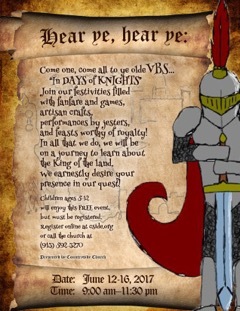 Hear Ye Hear Ye: Come one, come all to ye olde VBS! Join our festivities filled with fanfare and games, artisan crafts, performances by jesters, and feasts worthy of royalty! In all that we do, we will be on a journey to learn about the King of the land. We earnestly desire your presence in our quest! All children ages 5-12 will enjoy this free event but must be registered.